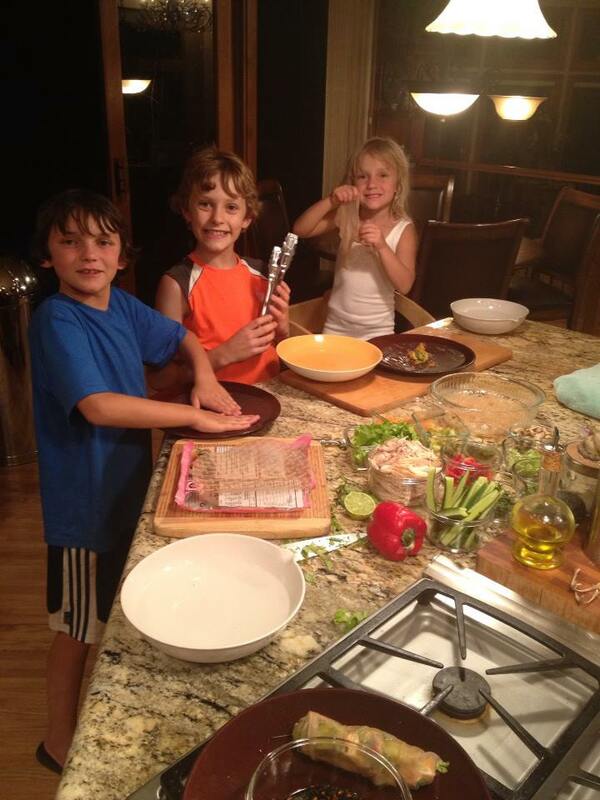 If we can teach our kids that healthy eating is fun, and help them develop the habits of nourishing their own bodies, they will begin to crave the foods–and experiences–that nourish their lives! • 1 package sea kelp noodles (optional)–boiled in chicken broth until soft. 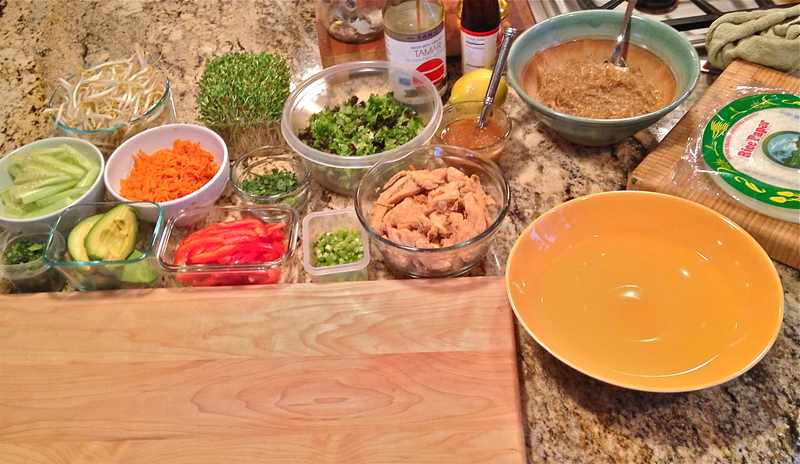 In a large bowl, combine chicken, coconut/canola oil, sesame oil, garlic, ginger, lime, and soy sauce. Cover well and allow to marinade for about 20 minutes. Heat frying pan to medium and cook chicken through. 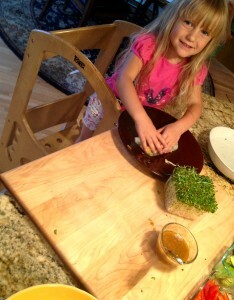 Place piles or bowls of vegetables next to a large cutting board, so everything is ready for rolling. Combine all Dipping Sauce ingredients into a small bowl, mix well, and set aside. 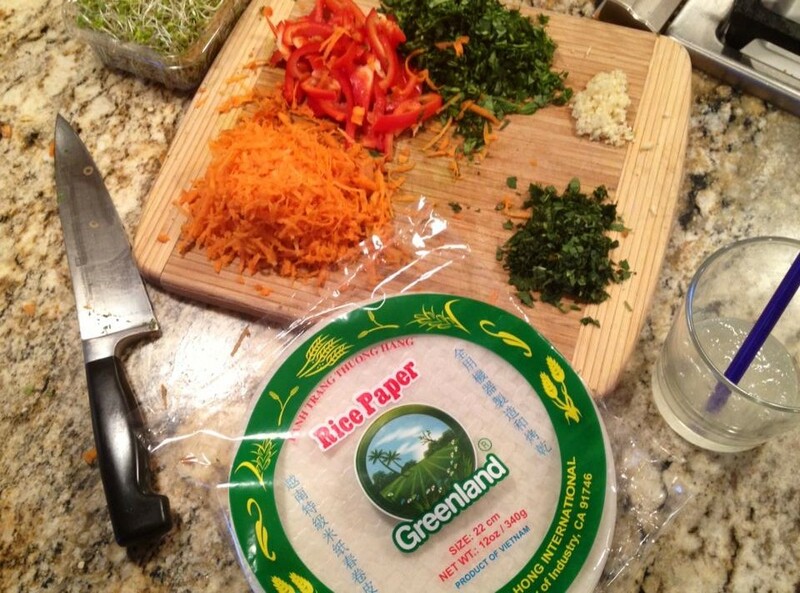 Gently dip each rice paper wrapper in warm water for about 10-15 seconds until soft. Do your best to keep the paper from folding over on itself–it becomes really sticky! Place rice paper on cutting board and fill with your choice of chicken and vegetable blend. Be sure to fill only as much as the paper will hold, and leave room on the ends to fold the paper over. Roll the wrapper over the fillings away from you, tucking in the sides, making sure all the fillings remain tight within the rice paper wrapper. Serve immediately with soy dip. My kids have loved trying out new things in each roll they make, and playing with the different flavors. They have a blast helping out in the kitchen, and these are a great way to get them involved from the cutting and peeling, to the soaking of rice paper, to creating their very own rolls! I’d love to hear some of the other variations that you come up with! 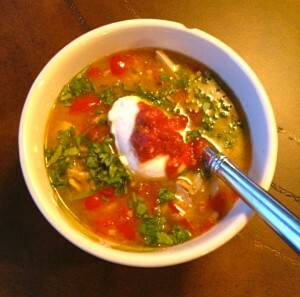 This recipe is adapted from a Yucatan style Chicken & Orzo soup that my kids and I love. I sometimes substitute rice for the orzo, when I’m looking for a little “lighter” flavor, and the rice goes nicely with the lime and cilantro. I also use a whole chicken, roasted, rather than boiling chicken breasts—which is what the Yucatan recipe calls for. Personally, I love using homemade chicken stock, when I have some in the freezer. I boil a chicken carcass for a day… sometimes two. This provides a very nutritious broth that has a full, delicious flavor. (When possible, I just keep my freezer stocked!) And recently, I’ve begun using fat-free Greek yogurt in place of sour cream. A perfect, and much healthier alternative. This soup is a wonderful “Summer Soup” with the fresh lime flavor and light, nutrient-rich ingredients. I hope you enjoy it! Blend together olive oil, lemon wedge, garlic, spices, salt & pepper. Place whole chicken, breast down, onto a “roasting stand,” and place in a roasting pan (or any pan that has fairly deep sides—about 2 inches deep). If you don’t have a roasting stand, just roast the chicken breast down in a roaster. Peel away skin, making “pockets” between the skin and the meat of the chicken. Marinade chicken, making sure to get plenty of marinade into the pockets of skin so that the chicken becomes as moist and flavorful as possible! Either tie or tuck legs close into the body so they don’t get too dark in the oven. Heat oil in large saucepan over medium heat. Add onion, garlic, and jalapeño. Sauté until onion begins to brown, about 4 minutes. Add chicken; sauté 1 minute. Add broth, lime juice, and tomato. Simmer until you’re certain that the chicken is cooked through and the rice is perfectly cooked. Season soup with salt and pepper and add lime juice if needed.